Tickets go on sale at 12pm, Friday November 2. Matt and his band perform songs from his fresh new album as his New Zealand debut, playing his first headline shows since the Telluric Tour in 2016. 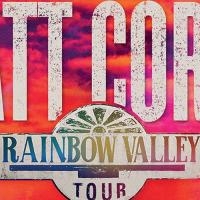 Begininng in January, the upcoming UK and European Rainbow Valley Tour has sold out already in some areas forcing an updated second date announcement added for London’s iconic Forum. For ten years plus, this multi-platinum-selling musician has been experimenting and exploring on a journey of profound self-discovery that’s brought him to out maneuvre a few pre-conceptions and wrestle his share of demons. With two ARIA Song of the Year awards and a #1 debut album behind him, Corby can genuinely own some well-earned perspective. Now we see a new chapter in Corby’s life with the release of his highly anticipated second album. Recorded in the idyllic surroundings of Byron Bay’s Music Farm studios, Rainbow Valley will be released this Friday November 2. Lush, multi-textured and inspired by touches of both old soul and futuristic psychedelia, Rainbow Valley is, in the artists own words “joyous music”, but it also has the depth and insight of an artist who understands you can’t just take the good times for granted, you have to earn them. The sparkling first single No Ordinary Life, the raw ballad All Fired Up and current single All That I See have received widespread acclaim and give fans a taste of what to expect on Corby’s stunning new album.